Should You Give Money to a Homeless Person? It’s happened to all of us. We’re walking along, minding our own business or perhaps enjoying a conversation with a friend and out of the corner of our eye we catch sight of him. There he is wearing layers of disheveled clothes, looking like he hasn’t showered in months and holding out a cup begging for change from every passerby. “Ridiculous”, you think to yourself, “why doesn’t he just clean himself up and get a job?” Then the “good” part of your conscience kicks in, “I should really give him something, what if he really is desperate for food? Ah, he’ll probably just buy drugs or booze anyways. I wouldn’t want to contribute to his problems”. And so you walk by feeling justified in your own mind. I know I’ve certainly been there. So what is the right thing to do? 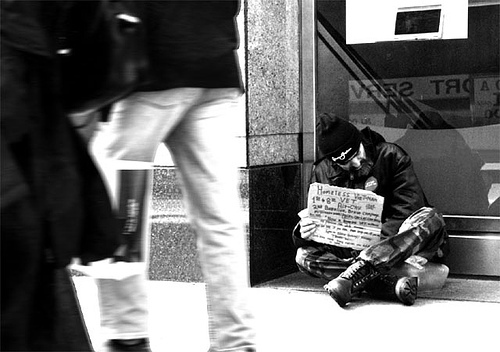 Should we give money to the homeless man or woman begging for help? I think it’s a fair question because on the one hand we all have an innate sense to help others. On the other hand a lot of us have that feeling that the homeless person will not use the money to buy food, but rather on something he shouldn’t whether it be lottery tickets, drugs or alcohol. Twenty-nine percent of homeless clients also report abuse or neglect in childhood from someone in their household (12 percent neglect, 22 percent physical abuse, and 13 percent sexual abuse). Thirty-three percent ran away from home and 22 percent were forced to leave home for at least 24 hours before they reached age 18. In addition, 21 percent report that their first period of homelessness predated their 18th birthday (this homelessness might have been with their family or on their own). Does that come as any surprise? We probably could have guessed there were various forms of abuse and neglect in their childhood. At the very least, this data gives us a reference point. 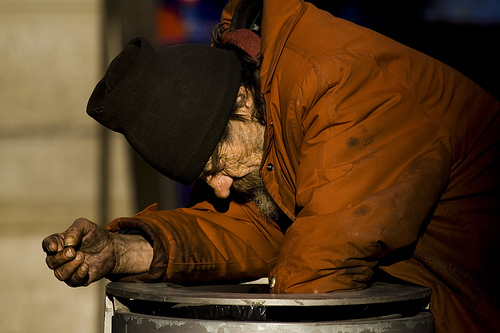 The next time we see a homeless person and think, “Just clean yourself up” we might be able to have some compassion instead and think about the rough childhood they had or the abuse they’ve gone through and the people skills and job training they never received from parents who loved them. Many of them have had a rough life. Food problems experienced by homeless clients included eating one meal a day or less (20 percent); being hungry in the past 30 days but not eating because they could not afford enough food (39 percent); and going a whole day without eating anything at all in the last 30 days (40 percent). Additionally, thirty-eight percent of homeless persons reported being robbed, while another forty-one percent reported having money or other items stolen from a locker or other place of storage. Seven percent reported being sexually assaulted or raped and another twenty-two percent were physically assaulted. This is a legitimate concern. After all, if you are going to help you would like to know that your money is going to buy food or clothing or other items they need and not go towards fueling some addiction. The NHSACP study reported that over the course of their lifetime, 62 percent of homeless respondents reported problems with alcohol use and 58 percent reported problems with the use of drugs. We need to remind ourselves, however, that not every homeless person will buy drugs or alcohol. We shouldn’t generalize and stereotype every homeless person. To do so would be an insult to their personhood and worth much like you and I feel slighted when someone paints us with a broad brushstroke. Do not think twice about calling alcohol and drug hotlines if you think a friend or a loved one needs that kind of help. 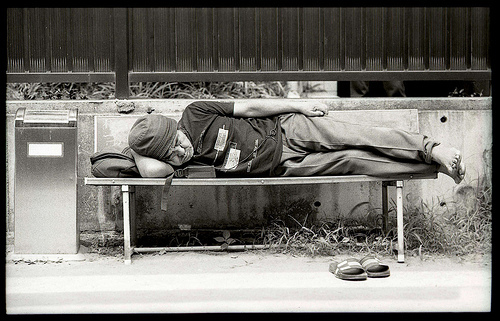 What Should Our Attitude Be Towards the Homeless? 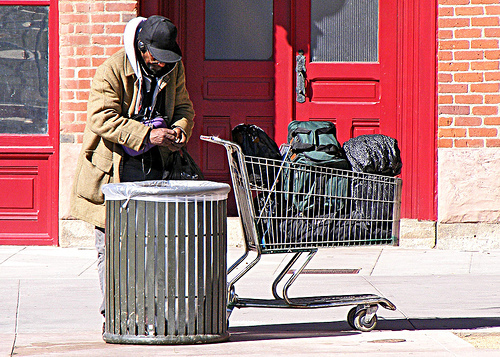 I have to admit, I have a lot of growing to do in this area, but what stood out in my mind as I read this study is that in general homeless persons don’t want to be homeless, but as a result of many contributing factors they are many times unsure how or, in some cases, mentally or physically unable to break free from their lifestyle. The other thing that impacted me in this study is the realization that many, if not all, of the homeless people we see today have had a rough life. They haven’t had a good childhood or education. Many of them have been abused and neglected, which means that I need to be more compassionate and understanding rather than judgmental and arrogant. I was reminded recently from a friend that we shouldn’t be motivated by guilt to help the needy because guilt will eventually burn us out. Instead, we should be motivated by the fact that we are the needy and the spiritually poor, and Jesus has come and given us His life so that we can have eternal, abundant life through Him. Because of what He’s done for us we can be a beacon of light and hope to others. How Should We Help The Homeless? It’s probably safe to admit that most of us have a desire to help people in need, but we’re just unsure how to go about it. We want to do something to help them and not hurt them or add to their problems. I don’t think we should stop giving money to the homeless, but certainly we can be a little discerning when we are giving. I remember listening to a sermon some time ago where John Piper asked the question of whether or not God would hold you accountable because you gave the homeless man $20 and he spent it on alcohol or would He say “Thank you for having a heart and compassion for the weak and the poor”. There are a number of things we can do to help the homeless. If you feel uncomfortable with giving money, then why not buy them lunch or dinner. You could always give them warmer clothes or buy them a cup of hot coffee on a cold day. What about serving in a soup kitchen or a homeless shelter. If you work in an area where you see the same homeless person on a regular basis, why not stop and talk to them and listen to their story? You might find there’s an actual person under those disheveled clothes. What do you think about giving money to the homeless? What are other ways we can help the poor and needy? What has been your experiences in this area?